A good myth never dies. A week ago ‘Business Insider’, a prominent online magazine, published to its Facebook page a video called ‘How an ancient Greek mathematician calculated the earth’s circumference’, about Eratosthenes’ calculation of the earth’s size. At the time of writing, the video has 3.2 million views, 29,000 likes, 55,000 shares, and 1200 comments. A lot of people have had their views informed by this video. Now, initially I wasn’t sure it’s a good idea to re-tread old ground: I’ve written two posts relating to this subject before. One was on a myth about Eratosthenes’ calculation, to do with a well at Syene; another was on ancient flat-earthers. But as I watched the video I couldn’t help counting untruths. I found myself thinking about doing a kind of postscript to the earlier posts, just giving a quick list of errors. On reflection, I decided that a ‘fact-check’ would be a more even-handed way of treating it. And I think it is worth doing: partly because of the number of people this video has reached in one week, partly because my earliest post focused on just one myth. So let’s do that: a fact-check. In the mid-20th century we began launching satellites into space that would help us determine the exact circumference of the earth: 40,030 km. True. The earth is slightly oblate, so its circumference from pole-to-pole-to-pole is 40,008 km, and its circumference around the equator is 40,075 km. If it were an exact sphere, with the same volume as the real earth, its circumference would be 40,032 km. I interpret the video’s claim as accurate to four significant figures. Mixed. ‘Over 2000 years earlier’ is accurate. Eratosthenes can be considered ethnically Greek, to an extent, but this certainly didn’t take place in Greece: as the video itself goes on to point out, Eratosthenes lived in Egypt. He came from Cyrene, in modern Libya. a man arrived at nearly that exact same figure by putting a stick in the ground. Mostly true. His achievement wasn’t nearly as single-handed as the video makes out, but his creative insight was certainly the basis for the finding. That man was Eratosthenes: a Greek mathematician and the head of the library of Alexandria. Eratosthenes had heard that in Syene, a city to the south of Alexandria, no vertical shadows were cast at noon on the summer solstice. The sun was directly overhead. (1) The opening phrasing ‘Eratosthenes had heard’ gives the impression that it was a lucky chance that Eratosthenes found this out. It was in fact a long-standing piece of knowledge, known both to Ptolemaic surveyors and to the native Egyptian population. Egyptian gnomons -- the ‘sticks’ that they used for determining the date of the solstice -- had a bit more to them than just sticking a post in the ground. In fact, specifically to compensate for the shortness of shadows at the summer solstice, Egyptian surveyors adopted the practice of tilting gnomons to the north, so that there would be a shadow to measure (source). He wondered if this were also true in Alexandria. False. He already knew. The practice of taking gnomon readings to determine latitude had been in use since at least the early 4th century, when Pytheas of Massalia took gnomon readings all the way from southern France to a place called ‘Thoulē’ (a.k.a. Thule) somewhere in, or neighbouring, the North Sea. (Source: Martianus Capella De nuptiis 6.595). Also before Eratosthenes’ time, Philon, a surveyor for Ptolemy II, reported gnomon readings at Meroë in a book called the Aethiopica. (Source: New Jacoby 670 F 2 = Strabo 2.1.20.) Eratosthenes, and anyone else who knew anything about geography, knew perfectly well that shadow lengths varied at different latitudes. and waited to see if a shadow would be cast at noon. It turns out there was one, and it measured about 7 degrees. False. See above: the basis of the calculation wasn’t a single angle measurement, but the difference between angles in multiple gnomon readings. 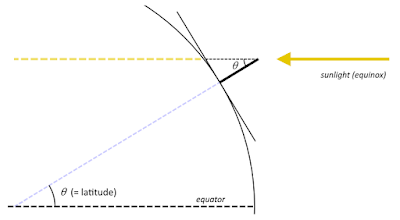 Now if the sun’s rays are coming in at the same angle at the same time of day, and a stick in Alexandria is casting a shadow while a stick in Syene is not, it must mean that the earth’s surface is curved. And Eratosthenes probably already knew that. False. The claim that Pythagoras was a round-earther is based on Diogenes Laertius 8.48, but there is no doubt whatsoever that it is false. Diogenes Laertius is unreliable at the best of times, and the passage also ascribes round-earthism to Hesiod and Anaximander, and we know for certain that both of them were definitely flat-earthers. We don't know for sure who was the first to realise the spherical shape of the earth, but it was probably a Greek in the latter part of the 400s BCE. Dirk Couprie, Heaven and earth in ancient Greek cosmology (2011) p. 169, suspects Oenopides (mid-400s BCE), who is credited as the discoverer of the angle of the ecliptic. 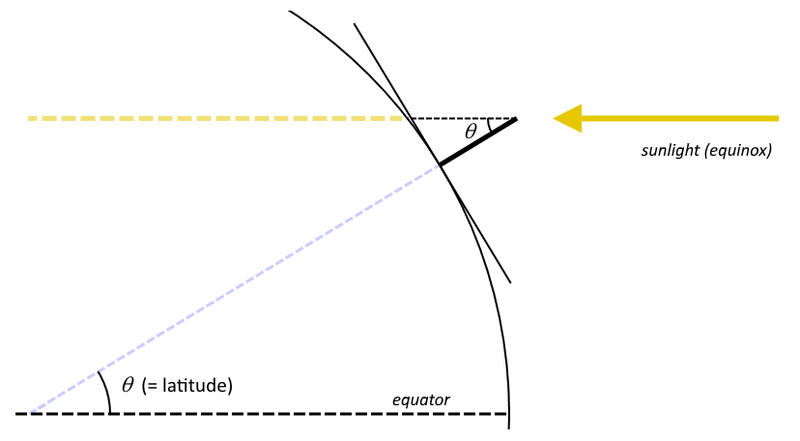 The ecliptic is the plane of the earth’s orbit, at an angle to the equator. The fact that the plane of the ecliptic coincides with the Tropic of Cancer at the solstice could well have led Oenopides, or someone shortly after his time, to realise that the ecliptic and the Tropic taken together implied a spherical earth. and validated by Aristotle a couple of centuries later. True. The relevant passage is Aristotle’s On the sky 296b-297b, where he outlines several kinds of empirical evidence for the earth’s shape. If the earth really was a sphere, Eratosthenes could use his observations to estimate the circumference of the entire planet. 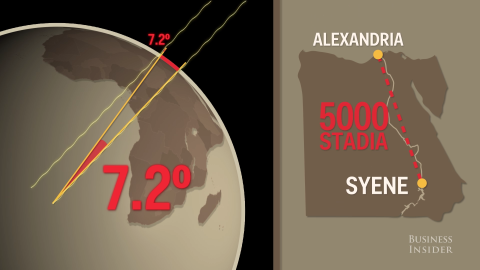 Since the difference in shadow length is 7 degrees between Alexandria and Syene, that means the two cities are 7 degrees apart on earth’s 360-degree surface. False. No evidence exists to suggest this. However, we do have evidence of Ptolemaic surveyors travelling into southern Egypt and Sudan decades before Eratosthenes, and writing books about it, including gnomon measurements taken at Syene and Meroë. Just the ones that we know of: Philon, an official during the reign of Ptolemy II who wrote an Aethiopica recording gnomon readings (New Jacoby 670); Dalion (FGrH 666), who went further south still; and Simonides (FGrH 669), who spent five years in Meroë, apparently as an ambassador of Ptolemy II. (Eratosthenes) states that the Nile is 900 or 1000 stadia to the west of the Arabian Gulf, and has a similar shape to a backwards letter N. For, he says, it flows northward from Meroë about 2700 stadia, then turns back to the south and the winter sunset for about 3700 stadia, and it almost reaches the same parallel as the Meroë region and makes its way far into Libya. Then it makes another turn, and flows northward 5300 stadia to the great cataract, curving slightly to the east; then 1200 stadia to the smaller cataract at Syene, and then 5300 more to the sea. Could 5300 be the distance along the course of the Nile, and 5000 the distance along the meridian? No, that’s not it. In fact the distance measurements may be much older still -- by nearly two thousand years. Eratosthenes says that he records the distances that have been handed down, but does not validate them, reporting them as they have been received, although at times adding ‘by means of a more or less straight line’. Priskin goes on to suggest that the variation between the two figures, 5300 stadia and 5000 stadia, comes from substracting the stretch of 300 stadia around Syene where the sun was directly overhead at noon on the solstice. I don’t think that sounds compelling -- though it could be true. Another possibility is that we’re looking at two different standards for the stadion: there were many different reckonings. The usual standard quoted by ancient sources is 8 stadia = 1 Roman mile. The Greek stadion may have been variable and imprecise, but Roman measurements were precise to between three and four significant figures, so we know the length of a Roman mile very well indeed: 1478 m ± 3 m. (Here’s the classic source on the subject: Hultsch’s Griechische und römische Metrologie (1882), pp. 88-98.) This gives a ‘standard’ stadion of between 184.4 m and 185.1 m. It also coincides well with the Attic stadion of 184-186 m, whose length we know thanks to (1) the length of the racetrack at Athens, and (2) the ancient reckoning of 1 Attic stadion = 600 Attic feet. And it so happens that 5300 × 175 m comes out to 927.5 km, very close to 5000 × 185 m = 925 km. If this is right, it implies that the distances quoted in Strabo 17.1.2, with 5300 stadia, are given in the Herodotean stadion; this would then be the unit that Eratosthenes used in his work the Geographica. And the distances that served as the basis for his calculation of the earth’s circumference, with 5000 stadia, would be in the standard stadion. Actually I don’t find that very compelling either, even though it does sound good. Basically I don’t buy that the stadion was ever as precise as that. Extant sources that convert stadia to Roman miles quote lengths for the stadion that range between 157.5 m (Pliny NH 12.53, using Dreyer’s conversion rates) and 210 m (the ‘Ptolemaic’ stadion as quoted by Dreyer), or even more. Let’s just say: it’s very doubtful. which is about 800 km. False. See above about the imprecision of the Greek stadion. Using the ‘Herodotean’ stadion of 175 m reconstructed by Priskin, 5000 stadia would come out as 875 km; using the standard stadion of 185 m, it would come out as about 925 km. A measure of 800 km presumes a stadion that is 160 m long, much too short to be realistic. On one calculation, Eratosthenes’ stadion according to Pliny works out to 157.5 m, but see above: that is far shorter than any other ancient reckoning available to us. (It’s also incompatible with Eratosthenes’ stadion according to Julian of Ascalon, which works out to ca. 179 m). More importantly, the traditional calculation of 157.5 m is based on a obsolete figure for the length of the Egyptian schoenus. Dreyer quoted the schoenus as equal to 12,000 royal Egyptian cubits of 0.525 m each. But subsequent scholarship has consistently shown that the schoenus was actually 20,000 royal cubits (see e.g. Priskin’s article). This would make the ‘Eratosthenean’ stadion according to Pliny come out to 262.5 m. 157.5 m is ludicrously low, 262.5 m is ludicrously high. Other measures for the stadion range between 181.3 and 192.25 m (figures quoted by the New Pauly): even the ‘Herodotean’ stadion is suspiciously short for that range. Pliny’s figure is not just suspicious, it’s wildly out of whack with absolutely every other known measure of the stadion. It must simply be wrong. He could then use simple proportions to find the earth’s circumference. 7.2 degrees is one fiftieth of 360 degrees, so 800 km times 50 equals 40,000 km. And just like that, a man 2200 years ago found the circumference of the entire planet with just a stick and his brain. Mostly true, aside from the 800 km bit which we looked at already. It’s the bit about ‘with just a stick and his brain’ that’s a problem. That should really say: ‘with (1) a stick marked by carefully measured gauge markings and kept vertical by a system of plumb bobs, (2) nearly two centuries of explorers and Ptolemaic surveyors testing the methodology of taking measurements with these sticks as a measure of latitude (3) and taking measurements at exactly the places he needed, (4) a traditional measure of the length of Egypt dating back nearly two millennia before his time, and (5) his brain’. Yes, it was a remarkable achievement, but he wasn’t a lone genius. He was most definitely standing on the shoulders of giants. The Business Insider video is a pretty even blend of truth and falsehood. Does that sound reasonable? It shouldn’t. Let’s be clear: nearly half false is not a good thing. If I wrote a textbook that was half false, I would rightfully be fired and, I hope, barred from ever teaching in that field. Not good, Business Insider: not good. Maybe Carl Sagan and NASA shouldn’t be your sole sources for ancient history, a topic neither of them knows much about. Just a suggestion. Pythagoras and the beans #1: hands off beans!